Top Auto Repair was started in 1986 in Garland, Texas. We were located originally in a different area not too far away from our current location. We moved to our current location in March of 1990. Which makes our total years of experience in the automotive business a total of 20 years. Without a major customer base when we first started our existence was completely based on word of mouth. And because of this reason we would like to thank each and every one of our customers for our continued success. Although we may be late we would like to tell our customers that we listen to and would like to get to know our customers at a more personal level and that is why we have started this web site. So for we at Top Auto to become a better place to do business with, we need you as the customer, to help us by giving us feedback. We will always continue to improve our customer relations as we have in the past and continue that trend into the future to become your number one source for automotive repair in the Dallas area. So for us to reach that goal of serving you better, we need your continued feedback and business. 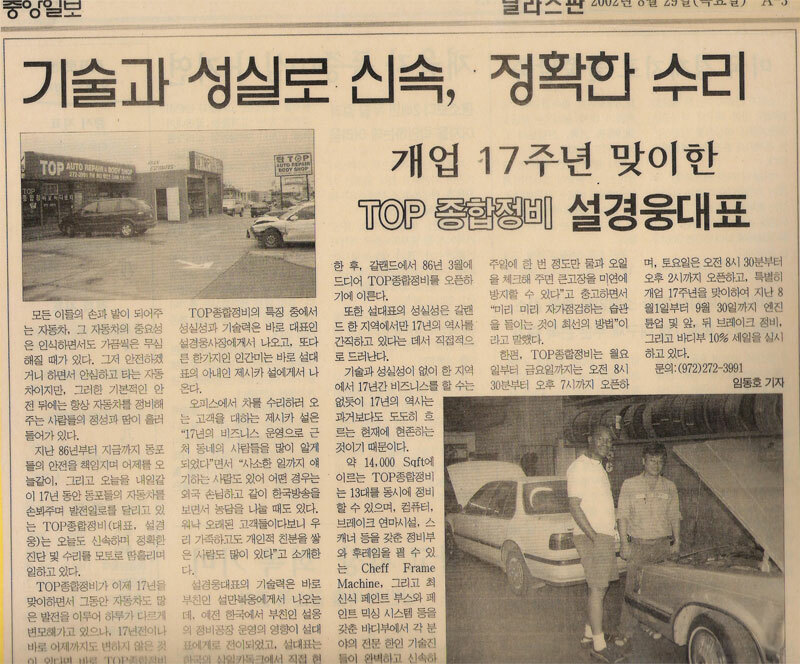 저의 탑정비 바디샾은 1986년도에 갈랜드에서 첫 개업을하였습니다. 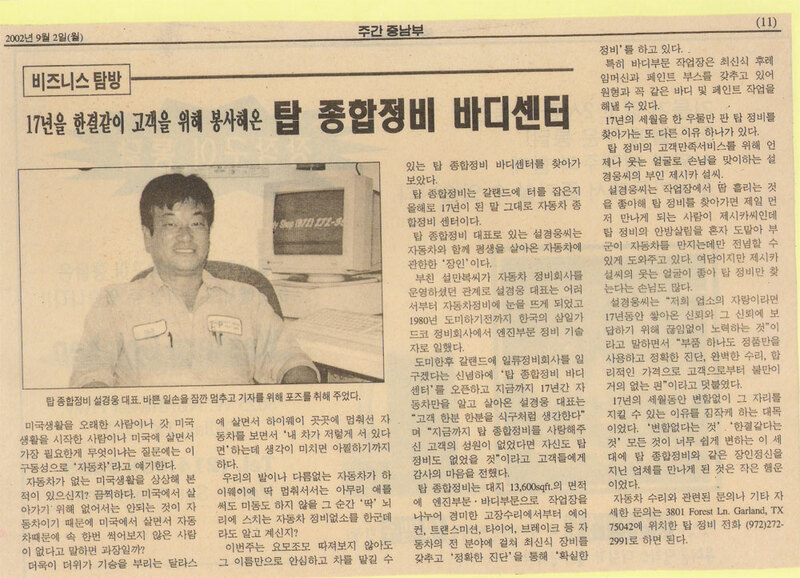 1990년 3월 이곳 장소 갈랜드로 이전하여 어언 20년이란 세월이 흘렀습니다. 손님 여러분의 도와주심으로 저희 탑정비는 이렇게 성장 하게 되어 고개 숙여 감사를 드립니다. 그리고 손님 여러분의 조언과 칭찬을 다 받아드리길 위해 , 앞으로는 더욱 더 노력하기 위한 초심의 마음 되어 불편함 없이 모시려는 착안으로, 더 가까이 더 빠르게 가기 위해 홈 페이지를 개설 하였습니다. 앞으로 많은 힘이 되어 주실 손님 여러분의 많은 지도편달 부탁 드립니다. 지금까지 해온 것 보다 더 앞으로도 노력하며 ,연구하며, 차에 관한 제1인자가 되도록 열심히 노력 하겠습니다. 근무지에서 편히 좀더 빨리 다가갈 수 있도록 조언과 칭찬, 격려 로 힘을 실을수있는 홈페지 방문을 부탁 드림니다. 다시 한번 고개숙여 감사드립니다. 손님 여러분 오늘도 좋은 하루 되시길!